Such was their rise to the top bracket that they were briefly acclaimed to be the new 'Beatles'. This London group were started by Clark who had already had one succesful show business career as a film stuntman, whereas Mike Smith was a junior for Tottenham Hotspur. Little wonder then that their image at the time was one of physical fitness! Their first few singles didn't do much and their first to chart was eclipsed by a version by Brian Poole. However their drums dominated beat became a familiar sound as their next release 'Glad All Over', penned by Smith, went all the way to #1. 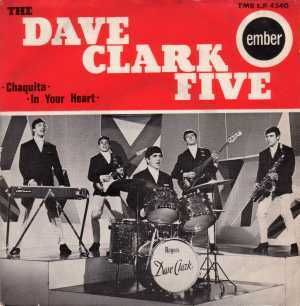 Dave Clark was also co-credited on this number and in this and all else he always proved to be a shrewd businessman, controlling the rights to the group's music as far as possible. He would also buy the rights to the legendary TV Pop show 'Ready Steady Go' and consequently 'cleaned up' when video tape became commonplace. The EP shown on the left is quite a rare find. It features the only two tracks they recorded that were released on the Ember label in 1962. However, this EP was not released until 1964- after the date that the band had become famous. Interestingly, as Ember only had the two tracks they filled the 'B' side with a track by another London group called the "Washington D.C.s", and another by vocalist/ guitarist Ray Singer (later with Nirvana). The group's British success was matched by that in the U.S. and they notched up a series of hits there too. However, despite their high quality output they were never a new 'Beatles' and their popularity began to slowly fade along with the decade and they ceased touring during 1968. The group also hold the rare distinction of having recorded two different songs with the same title; 'Everybody Knows' from 1965 is quite different to that of 1967.